The Department of Transportation, working in conjunction with the Departments of Aging and Public Welfare and the Office of the Budget, has completed its evaluation of human service transportation and has delivered the report to the Governor and the Majority and Minority chairs of the House and Senate Transportation Committees. The report has been placed on the PennDOT website under Public Transportation/Bureau of Public Transportation/Bureau Publications. 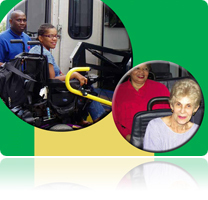 The Community Transportation Association of America and the National Resource Center has created this listing of documents they consider to be the foundation of Human Service Transportation coordination research. This report presents general coordination concepts, strategies for increasing coordination, and the benefits and industry-wide impacts of coordination. Strategies for coordination include generating new revenues by providing services to new markets, contracting with other agencies to provide services to their current clientele, and coordinated dispatching. Local benefits include increased sources of funding, increased efficiency, increased mobility, and secondary economic benefits. This report explores existing coordinated planning processes within state departments of transportation (DOTs) that meet the Federal Transit Administration's (FTA's) requirements. The report also examines aspects of those processes that will be useful to other state DOTs and their planning partners as they develop or revise their own planning processes. This resource provides ideas and suggestions for increased involvement by people with disabilities in communities' coordination efforts toward accessible transportation. Publication is designed to support people with disabilities in their participation and for the communities involving them in processes. This toolkit describes basic coordination concepts, describe the process for initiating new coordinated transportation efforts, present techniques for improving the effectiveness of existing efforts, and provide a number of case studies for demonstrative purposes. TA new report examines Medicaid's non-emergency medical transportation assurance and the role played by the assurance as policymakers debate national health reform. What I especially like about this brief is that it answers the question -- how did we get into this situation -- with a narrative that researches the various legal issues and court cases that have been a major part of the history of Medicaid Transportation. It also supports the basic premise that there cannot be a successful health care strategy without mobility. From the Executive Summary: "For several years, AARP has encouraged states to implement the Federal Highway Administration's roadway engineering guidelines for older drivers and pedestrians. More recently, AARP has endorsed the planning concept Complete Streets. Complete Streets bare those that are designed for the safety and comfort of all road users, regardless of age and ability. Naturally, this definition should extend to the needs of older road users. But does it in practice? And do the engineering solutions offered for older drivers work for pedestrians and bicyclists, the major focus of the Complete Streets movement? The AARP Public Policy Institute (PPI) embarked upon this project to discover the nexus between these two, as of yet, distinct areas of research and practice. To accomplish this PPI formed an interdisciplinary team of planners, engineers, and policy advocates to review the safety research and offer both policy and design recommendations that can be used by engineers, planners, and citizen advocates in their quest to build safe, more livable streets for everyone." This report documents the finding of the 2001 This report discusses both the isolation of older people without transportation options and highlights their willingness to use public transportation when it is available to them, demonstrating the inextricable connection of public transit to livable communities. This report presents six case studies on coordinated transportation efforts involving Native American tribes. One case study reported the efforts to develop the North Central Regional Transit District in New Mexico that involved all five area Indian pueblos. To address challenges related to equitable representation on the authority board, weighted voting based on population which gave additional power to the pueblos was introduced. The GAO identified 62 federal programs that provide transportation funding. Together these programs annually expend billions of dollars in funding from federal, state, and local sources. The impacts of coordinated transportation have varied by community; many have experienced positive benefits. Communities with programs that have not coordinated often suffer from duplicated or fragmented services. The goals and objectives of the Coordinated Council on Access and Management have not been presented in measurable terms and are not linked to its activities. The strategic and annual plans of the Departments of Transportation, Health and Human Services, Labor, and Education contain few, if any references to coordinated transportation services. The study identifies three obstacles to coordination: reluctance to coordinate due to concerns about client needs; program requirements; and lack of leadership including federal guidance. Potential solutions include uniform standards, e.g. driver training and safety belts; the holding of interagency forums to share information on guidance; and the presence of financial incentives or requirements for coordinated efforts. This report serves as a resource guide for public, private, and human services organizations that transport transportation-disadvantaged individuals. The study was built on the findings of 22 case studies that focus on coordination strategies. The study identified the importance of coalition building; the need for leadership at the local and state levels; for a coordination champion which need not be the local transit agency; and the role of federal programs and state-level initiatives for encouraging increased coordination. It also noted the importance of planning and the potential benefits from utilizing nontraditional funding sources and implementing technology. The GAO found that the Departments of Transportation, Health and Human Services, Labor, and Education were making progress to address recommendations made by GAO-03-697. However, the Federal Transit Administration was the only agency to have adopted performance based measures in its strategic plan. The Departments of Labor and Education have joined the Coordinating Council on Access and Mobility. Guidance on coordinated efforts has been developed by three of the four departments, the exception being the Department of Education. Together, the four Departments initiated the "United We Ride" program to provide assistance to states and communities to address coordination challenges. This report explores how governors can improve the efficiency and effectiveness of transportation services in their states though coordination. Coordination can increase the level and quality of service, eliminate duplication, and make transportation more cost effective. Three key factors: leadership, participation, and continuity have been present in successful statewide coordination efforts. Establishment of formal coordination arrangements provide access to additional resources at the federal, state, and local level. Best practices in coordinated transportation in seven states and performance measurement techniques were included as appendices. This study presents the finding of 15 case studies on coordinated transportation. The case studies provided real world examples through a seven stage coordination planning process. The process includes: (1) forming partnerships; (2) sharing resources; (3) identifying needs; (4) identifying services, costs, and revenues; (5) cost sharing; (6) measuring performance; and (7) measuring savings and benefits. This project was conducted by the National Policy Consensus Center (NPCC) with oversight from FHWA's Office of Project Development and Environmental Review. The NPCC team developed and tested an assessment tool/questionnaire to use in interviewing state officials and other stakeholders during site visits. The assessment questionnaire was designed to collect information in four areas of interest: (1) issues, barriers and obstacles to transportation planning and project development; (2) current communication and coordination methods; (3) use of collaborative approaches; and (4) future opportunities for collaboration and training. This report identifies federal sources of transportation funding, examples of successful local coordination efforts, and made recommendations for further research. It was recommended that a methodology to conduct a cost-benefit analysis of coordinated community transportation be developed.